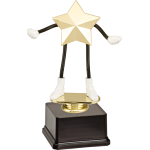 Bendable Dude star trophy features a hard plastic body and bendable arms and legs, allowing you to pose the figure in fun positions. Figures stand 5" tall, not including base height. Includes base and free personalization on a laser engraved plate, or for an additional $5.00, select an engraved brass plate. Select faux bases for trophies requiring more room for engraving.